Wireless networks are very common, both for organizations and individuals. However, wireless networking has many security issues. Crackers have found wireless networks relatively easy to break into, and even use wireless technology to crack into wired networks. There are a great number of security risks associated with the current wireless protocols and encryption methods, and in the carelessness and ignorance that exists at the user and corporate IT level. Cracking methods have become much more sophisticated and innovative with wireless technology. This workshop has been designed for networking and network security professionals who want to increase their expertise and skills in wireless security. With the growth of wireless networks, all security professionals must become knowledgeable about wireless security in particular since wireless networks are relatively more vulnerable than normal LANs. 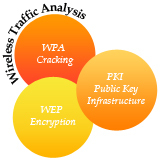 Wireless technology is also popularly used to compromise non-wireless networks. Network administrators must be aware of these risks, and stay up-to-date on any new risks that arise. This workshop will provide participants with the necessary skills for implementing and managing wireless security in the enterprise including how hackers attack networks and how to prevent them from doing so. Participants will understand the most up-to-date WLAN intrusion and DoS tools and techniques, functionality of the 802.11i amendment to the 802.11 standard, the inner-workings of each EAP type used with wireless LANs today, and every class and type of WLAN security solution available on the market - from wireless intrusion prevention systems to wireless network management systems. All participants will get hands-on experience in configuring, testing, and implementing a broad variety of wireless security solutions. This workshop will significantly benefit professionals responsible for the integrity of the wireless network / infrastructure. Anyone aspiring to understand the requirements for Wireless Security would benefit from this workshop. The program is restricted to participants who have adequate knowledge of wireless networking and TCP/IP concepts.